The exercises I will cover in this series are intended to develop more sensitivity and responsiveness in your horse and remove resistance to your cues, making it much easier to develop proper collection and maneuverability. They are extremely helpful in teaching your horse to think independently about each foot and to move any foot in any direction while developing mental focus. For these exercises to be effective it is important that the rider has a good seat and has good timing and feel in their hands. Some of the exercises I’ll describe here may not, at first, seem like something you think you need, because your horse can already win in the show ring, and he or she is calm and doing well enough to suit you on the trail. But using a horse to do a job outside the show ring is a very different situation. Many movements that are needed from a horse in the sorting pens on a ranch are often never asked for in a timed cattle event (like team sorting or cutting) or in a western or dressage show class. Yet they can really awaken a horse who may be burned out with his or her training program. Plus, if you teach a horse to do new things in varying environments that cause it to focus and try things it may never directly use in a horse show, by the time you ride them into the show ring there is nothing they haven’t seen or done before. So why would they be nervous or spooky? The exercises I will begin with involve teaching the horse to move forward or backward while turning right or left and pivoting on any one of his four feet that you choose. A pivot foot is stationary by definition, but we can also think of it as the slowest foot in a circle, in which case the foot will actually be moving forward or backward. For example, a car has four wheels, just as a horse has four legs. When you turn your car to the right, you are moving forward and the car’s right rear wheel will be moving slower than the other wheels. This is the “pivot wheel”, and the sharper you turn the front wheels to the right the smaller the circle becomes that the right back wheel makes. If the turn is sharp enough the wheel will just be spinning in one place, but the car is still going forward in a small circle. Your horse works the same way. When your horse is moving forward and you ask it to turn right by moving its forehand to the right, it will be pivoting on its right back foot. This is its “pivot foot”, also called the “inside back foot”. We will do that exercise farther along in this series. But if you back-up your horse when you turn his forehand to the right you have just changed the pivot foot from the right back foot (inside foot) to the left back foot (outside foot). You have also caused the horse to collect himself. You are steering with the front of the horse, moving his shoulders away from your left leg and left rein toward the right. You should keep his nose pointed in the direction he’s turning. The same principles apply to turning left, only in reverse. To begin this training series, I will focus on just one foot and one direction. This first exercise is probably the simplest to learn and teach, and you and your horse may already know it. It is extremely useful when working and sorting cows in the pens. 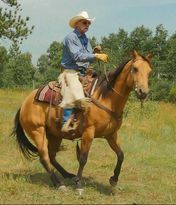 The faster and smoother the horse can do it the better job you and your horse can do sorting a bunch of cattle – and the better the horse will be at future exercises. As we progress in the coming months things will become a bit more challenging. Back-up and turn & Backing in Circles – while pivoting on the outside back foot. We’ll start with pivoting on the outside back foot when we turn the forehand. Remember that a circle can be very wide, or it can be very small so that the pivot foot essentially stays in one place – it is still a circle. There are a few things that we need a horse to be able to do in order to move beyond the basics. And, a rider needs to be able to effectively ask and teach a horse to do them. They will make doing these and future exercises much easier. If a horse is not good at some of them you will find that working on these exercises will help, and future articles will also be dedicated specifically to developing them. ​(Photo 1) If a horse is developing what we call a “soft feel” he should drop his head and bring his nose in when you pick up the reins. not just because you spurred him or pulled on him. Many riders who only train for certain show events believe that you should never pivot a horse on the outside back foot in a turn. This is only true sometimes. For example, if you are asking for a spin you want the horse to pivot on the inside back foot because a spin is a forward movement. But many trainers work hard to never let a horse ever pivot on an outside back foot because it is never asked for in a reining class. They don’t want the horse to think it is ever allowed so that he won’t accidentally do it during a spin. But it is allowed in the right circumstances and is done naturally by the horse in cutting, and is very necessary when working cows in the sorting pens in the real world on a ranch. We should be able to ride in a way that the horse can tell whether we want an outside or an inside back pivot foot, since an inside pivot foot is a forward movement and an outside pivot foot is a backward movement. We have to ride it that way. This is one way these exercises will make a better rider out of you and make a more useful partner out of your horse. I don’t want to over-emphasize the back and turn, because its all about keeping things balanced with all the different movements we need a horse to make. It is actually easier to teach the “back and turn” than the turn using the inside pivot foot because the horse collects itself naturally when we shift his weight to the back feet in preparation for this turn. Collection is more difficult to get and keep when pivoting on the inside back foot if a horse has learned to push into the bit or bosal. We’ll discuss that in an upcoming article. I am turning this horse to his right in this photo. He has shifted his weight to his hind quarters to lighten his front end in order to make the turn. This is a very useful turn when working cattle in a sorting pen. This is where some riders will run into a problem. If your horse is hard in the nose and pushes into the bit or bosal he will likely shift his weight forward onto his front quarters. This will lighten his rear-end and likely cause him to pivot on his forehand or on his center of mass while he ignores your left leg cue to turn right. We call this “turning like a bottle”. If this occurs you’ll need to back him up a step or two (until he “gives”) onto his hind quarters, until you feel a weight shift toward the rear. When you feel the weight shift, and while he is still backing, ask for the right turn. This will cause him to pivot on his left back foot when he turns right. This may take some effort on your part if your horse is used to pushing into the bit or bosal and dumping his weight forward. Stand your ground. When a horse is pushing on you, you must meet that pressure with your hands and not let him get away with it. But when he backs away from your hands you must immediately release. Pressure on a horse’s nose or mouth when you are doing this is not the same as being a heavy handed rider who is pulling on a horse for no reason. If your horse is soft in the mouth and nose and “gives” to the pressure and backs up well, you may discover that your horse may not respond well to the leg and rein cue to move the shoulders to the right. If this happens, start with the back-up, then “send” the right front foot to the right while driving the outside shoulder (left shoulder) to the right with the right rein and your left leg. (See Photo 3) Remember that your horse learns when pressure is released, so try to let your horse step into a release when he moves his right front foot to the right by releasing with your right hand. And try to release with your left foot when his left front foot steps to the right. I am turning this “green” (inexperienced) horse to his right. It is important that you send the right front foot so that you release the rein pressure with your right hand the instant the horse begins reaching to the right, while you drive the left front foot with your left leg and foot. Never lean into the turn. Interestingly, at this exact moment I could ask him to either go forward or backward as he turns. If I ride forward he’ll walk out of it and pivot on his right back foot and cross over with his front feet. If I ride him backward he’ll pivot on his left back foot and cross behind with his front feet. Both are useful for a horse and rider to know. This only works if he listens to my forward and backward seat. Remember to not let your left rein cross over to the other side of the horse’s neck, or you will be pulling his nose to the left with your left rein while you ask for a right turn. This creates the totally wrong head position for a turn. We want the horse’s head and nose to be pointing in the direction he is turning. There is another thing that may occur with some horses that’s worth mentioning. Horses that have been taught that they must always turn by pivoting on the inside back foot regardless of how their rider is sitting, and have been punished for ever pivoting on an outside back foot, will probably pivot on the inside back foot no matter how you ask or where you put their weight. They are not trying to learn something new, they are simply turning the way they’ve been taught, which includes ignoring whether their rider is actually riding forward or backward during the turn. This inexperienced horse is backing a clockwise circle – turning his front end to the right while pivoting on his left back foot. He has shifted his weight to his left back foot and is preparing to step back with his right hind foot. His left front foot will then cross behind his right front foot. His nose and neck are soft and he is looking in the direction he is turning. Sometimes, while the horse is learning to shift his weight back and not lean into the bit, he may hit his right front foot with his left front foot. This just means he hasn’t learned to back while turning, he’s still trying to go forward. We call this exercise “back and turn” if the pivot foot is stationary. If the outside back foot is moving slower than the other feet as we back-up it is called “backing in a circle”. It has tremendous benefits in teaching your horse to be soft on the bit or in his nose if you are using a bosal or rope halter. It is also very beneficial in teaching a horse correct body position to launch out of the turn into a gallop in the opposite direction. This move is very helpful in the real world on a ranch where fast direction changes are needed without moving forward at the same time, such as while sorting cattle in the pens. When they do this they will shift their pivot foot from the outside back foot to the inside back foot halfway through the turn, but that’s another lesson for the future. Remember that none of this will work well if you do not give your horse the proper release at the proper time. This goes for releasing rein pressure and leg pressure and also with how you sit the back-up and the turn. Many well trained horses who can win a show class or do certain jobs reasonably well may have difficulty doing this and some of the other exercises I will describe in the coming months, because in many cases you are asking the horse and rider to think outside the usual box. But if you’ll take the time to teach these things you will have a much more responsive horse who is more focused and tuned in to you. I am turning this horse to his left in this photo. Notice that the right front foot is crossing behind the left front foot because I am asking him to shift his weight to his hind quarters. My hope is to help you discover any missing ingredient that can take you and your horse to the next level. For those of you whose horse can already do this first exercise well, I think you will enjoy the upcoming exercises. We will be discussing turns on the inside back foot, the back-up, pivoting on the front feet, how you should sit when asking for each of these things, and many other things.